The Good: This recipe has a good amount of fiber, is low calorie and vegetarian. It uses a healthier cheese and yogurt (comparatively), as well as about 2 servings of veggies per bowl. This recipe contains 1 serving of fruit per bowl. 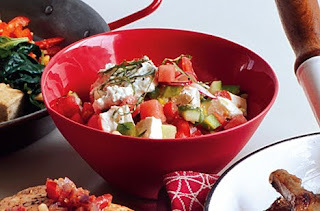 The Bad: Feta cheese is high in cholesterol and saturated fat (compared to most foods), and much of watermelon's calories come from natural sugar. Greek yogurt can be high in fat depending on type. 0 Response to "Recipe: Chopped Veggie Salad w/ Watermelon, Feta Cheese"